Welcome and I hope you enjoy and benefit from your visit to Humber Lodge #305′s official website. We are pleased you have stopped by and shown an interest in our lodge. 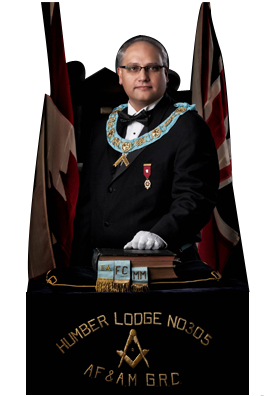 This website has been set-up as a vehicle of communication between Humber Lodge members, our brethren of the Craft and those interested for more information. We hope that you will find it interesting and informative and that it will dispel the widely misconception that Masonry is a secret society. Far from it, Masonry encourages publicity of its charitable donations and involvement in its local communities. We also encourage the development of person and we hope that this website will whet your appetite and encourage you to find out a little more. Since 1874 Humber Lodge has been operating in the Town of Weston, continuously adding into its already rich history. the Weston Masonic Temple has been Humber Lodge’s home since the building’s inception in 1923 and after our most recent renovation (2018), we have tried to maintain the traditional flair and elegance of Lodges of old, that combining with new updates and ease of access, still provide the best masonic experience possible to its members and visitors. If you are interested in more information, please do fill out the form and we will contact you. We are centrally located at 2040 Weston Rd, 2 blocks (Easy Walk) North of Lawrence Ave. There is limited parking behind the Temple, and plenty of parking on the street, which is free of charge after 4:00 pm. If your lodge is interested in becoming a Weston Masonic Temple tenant or you would like more information on hosting a party or dinner in our facility, please do fill out a “information request form” indicating your requirements.